A short evening ramble visiting the Coldstones Cut sculpture followed by a hunt for an Ordnance Survey rivet on nearby Greenhow Hill Top. This summer I’ve simply not managed to take as much advantage of the long days as I’d have liked. Indeed this was only the second after work outing I’d managed all year. The twin aims of this short route were to visit Andrew Sabin’s sculpture, Coldstones Cut, and to finally bag the nearby summit of Greenhow Hill Top. Starting from what used to be called the Toft Gate Kiln parking area, and what is now sign posted as Coldstones Cut, I first went to take a look at the nearby limekiln before heading up the broad path to Coldstones Cut. Strange to say this was, despite it only being about 25 minutes drive away, my first visit to the Coldstones Cut sculpture. In my defence I had been up there in 2009 when the path led up to a viewing platform above the quarry. For a long time after that visit when I heard about Coldstones Cut I thought it was just this viewing platform. 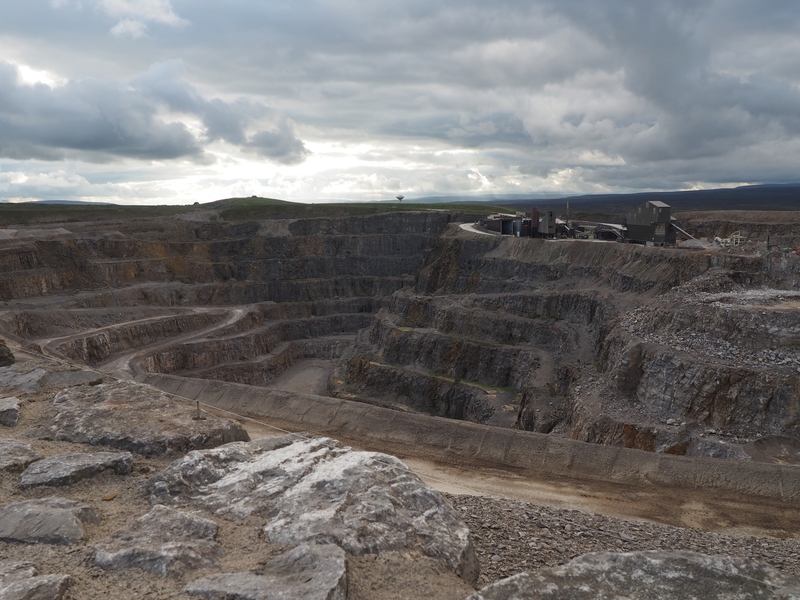 In fact it is well worth visiting, not necessarily for the view of the quarry, but for the interesting concentric layout, the information boards and the wider view. Indeed I was able to clearly make out York Minster over 30 miles away. The northernmost of the two circular viewing areas had been converted into a giant topograph showing not just the distance in miles to local landmarks but to places on the other side of the world, such as the Galapagos Islands, 9,985km away. Embedded in the floor of this particular platform was a plaque recording the height of 421m. This was of interest because a trig point was once situated on this hill at a height of 426.5m. This means that during the course of its operations the quarry works have removed at least 4.5m from the height of the hill. From Coldstones Cut I retraced my steps part of the way back down to the car park before taking the right of way which follows the fence around the perimeter of the quarry. In places the path was wet and reedy and I soon began to regret wearing three quarter length shorts, a mistake that was confirmed when I came to the nettle choked stile on the other side of the quarry’s access road. From the stile I passed Tewit Farm to cross Duck Lane and enter Galloway Pasture. The thin path here wasn’t always clear. I made my way to the remains of some prominent bumps, the remains of old mine workings and followed a line of these until reaching a broad track. Turning right on this I found a place to cross the nearby wall that wasn’t completely blocked by nettles. Once across the wall it was an easy walk up on to Greenhow Hill Top. My first job was to locate an Ordnance Survey rivet embedded in a small limestone outcrop just a few feet away from the unmarked grassy summit. A short way to the north-west was the main feature of the hill, the fenced off building that used to be a wireless station. The views from the top were extensive in all directions and I’d hoped to catch a sunset. After some promising evening light however the sun sank behind a large bank of cloud. Slightly disappointed I made my way back down to the track and followed this back to Duck Lane. Turning left on this I walked back into the village. An attempt to take a path that cut out a corner of the road did not last long when I took a look the amount of nettles I’d have to fight my way through – my calves and shins had already been stung enough for one walk! Back on the main street I turned right to pass the former Miners Arms and walked up to the main entrance to the quarry. Here I was able to leave the road by taking a permissive path that led me back to the Toft Gate parking area. While I’d achieved my objectives I have to say that as a walking route this wasn’t great and were it not for the fact I was limited by the amount of daylight a better, and slightly longer route, could be devised by utilising some of the paths to the north of the village. As I’m sure Greenhow Hill Top would be a good spot for sunset, as well as sunrise photos, I expect I’ll be back sooner rather than later. We had no map available at the time for the Howgills but we set off from a parking spot a few miles round from Sedbergh and walked up a beautiful fell and accessed two summits, it was a lovely walk. My husband took the grid reference and checked it today and it turns out it was Fell Head. Apart from the Calf is there any other peaks you would recommend in that area. I really must say your site is brilliant: it is so informative and I have learnt a lot just by taking a quick glance. Hi Sylvia, thanks for your comment – glad you like my website! I’m really pleased that you’ve also discovered the Howgills Fells as well, they are wonderful. To be honest almost any walk in the Howgill Fells is a cracker, with hardly any fences or walls it is a great place to make your own route and explore at will. Also in the north-west Dales there is Wild Boar Fell and, across the valley, High Seat and Mallerstang Edge.